National College Athletics Association (NCAA) President Mark Emmert delivers a speech during an event for the State of College Athletics in Tokyo, on Aug. 30, 2017. Emmert was in Tokyo offering Japanese sports industry leaders advice on forming its own collegiate athletics association. 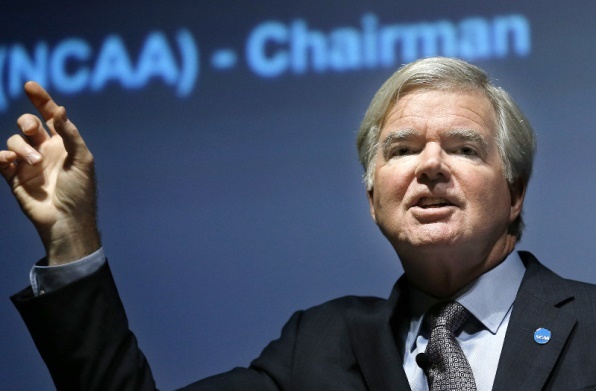 TOKYO (AP) -- NCAA president Mark Emmert offered Japanese sports industry leaders advice on forming their own collegiate athletics association on Wednesday. Japan is seeking to become one of the few countries outside the United States to establish an NCAA-type governing body for college sports. Emmert spoke to sports officials and representatives from more than 20 Japanese universities at a seminar in Tokyo. "When I was asked to come over here and talk about this, I jumped at the chance because I think it is a terrific opportunity and we want to help," Emmert said. "We'd like to be a part of this because we value sports as a part of education." Despite its success, few countries have followed the NCAA's model. Most countries do not view the integration of student-athletes the way American colleges do. After describing the history of the NCAA and how it benefits students and colleges, Emmert talked about the revenue generated from the association's 90 tournaments. "The way the NCAA works is we generate revenue off of only those 90 tournaments," Emmert said. "We don't have anything else other than those 90 tournaments that we put on television and sell tickets for. Fortunately they are very, very popular so they allow us to pass hundreds of millions of dollars back to the universities." Compared to the U.S., college sports in Japan have a long way to go, but Emmert said the time is right for a governing body similar to the NCAA. "You have an extraordinary opportunity," Emmert said. "You have some wonderful universities in Japan, you have a very strong higher education infrastructure here with some great schools and you have the enthusiasm of the Olympics in 2020, when you're whole nation is going to be focused on sport for the next three years as you roll into this incredible event." The NCAA is interested in expanding its brand overseas. Stanford played Rice in a regular season football game in Sydney, Australia, on Sunday, while universities in Canada and Mexico have either been admitted as NCAA members or are seeking to join the organization.